Submitted by Alchemist42 on March 2, 2015 – 6:59am. Hello all. I am very much hoping you good folks can assist me in sussing out my recent loaf troubles. I’ve searched the site for gummy and doughy issues and clearly it has not helped. So it appears time for some person to person interaction. Here is what is going on. I’ve am no stranger to baking. Been doing it 25+years. 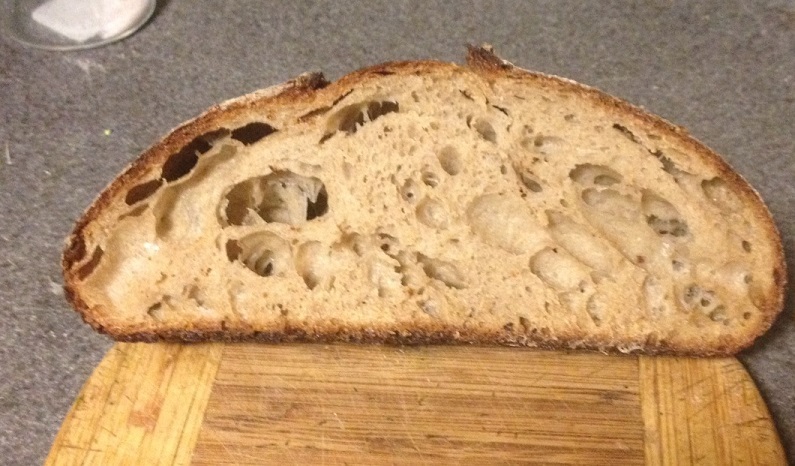 The last couple years have been very successful with high hydration doughs ala Tartine. I successfully, albeit not perfectly, made it through all of Chad’s recipes. No real issue except the basic learning curve of high hydration shaping. I have what I believe is a healthy 100% whole wheat culture started over 18 months ago. I say believe as it’s the one rock I have not overturned trying to diagnose my current issue. In the time since I started it I’ve kept it fed and it seems fine based on activity and aroma. I’ve baked little in the last year with it. Since I started again about 2 months ago, I have one recurring issue regardless of recipe. The inside of my loaves are gummy/doughy. Regardless of flour or recipe. As everyone seems to say, my belief is I’ve changed nothing. But of course something has changed. Details. Let’s go with yesterday’s loaf. Mix in remaining water and salt. Fold, stretch, turn every half hour for 2 hours. Bulk rest 3 hours. Pulled away nicely from bowl and had plenty of tension post fold. Pre-shape and bench rest 20 minutes. Final shaping and rise for 1 hour in floured bowl, seam side up. Oven pre-heat to 500 F. Cast iron skillet and lid heated 10 minutes. Load loaded and slashed. I am happy enough with the look but the texture is doughy still. You can see the shine and gloss on some of the surfaces. A run down of things I’ve checked. I’m sure I’ve missed some. 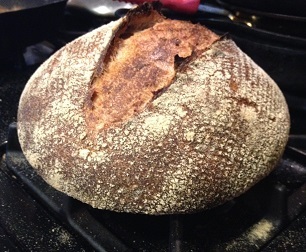 Tried with previously successful flours and recipes. Any and all questions and suggestions welcome. Let me know what details I can fill in. I’m tossing around ideas about enzyme issues, trying a lower temperature and starting a new culture.